March 18: studio and meetings about mapping project. All WWBP projects should be documented and posted by today. March 20: studio and meetings about mapping project. Midterm reviews. All-purpose 10 minute meeting to discuss projects 1 and 2, any questions you have on project 3, and proposal for the final independent project. March 25: present preliminary designs for Mapping Experience. The Washington Post recently published Vegetarian or omnivore: The environmental implications of diet, which examines the argument that meat production and consumption is unequivocally worse for the environment than plants. The author makes the point that while meat has higher greenhouse gas-per-kg cost than any vegetable, you need a lot more than 1 kg of broccoli to get the same amount of calories from 1 kg of beef. When you look at the cost in emissions per 1000 calories, broccoli is more damaging than pork or chicken (by the numbers). How you frame your data can skew the conclusions your audience draws. Keep this in mind when you work on ideas and implementation of your mapping project – especially if you do a literal geographic mapping project. Mapping the gross of something (such as the total number of car accident fatalities in a year) vs per capita (like the number of fatalities per 100,000 people) can have very different results. If you map total car accidents, states like California (~2800 fatalities) and New York (~1100) will come out on top because of their population size, and states like Iowa (~360) on the bottom. If you map accidents per person per year, you’ll find Iowa near the top (11.9 fatalities per 100,000 people) and New York realtively low (~6 per 100,000) (source). Not strictly related to data vis, but Penn’s first game jam is coming up at the end of March. It’s a competition to make a game in 48 hours, and is collaborative between teams of programmers, artists, designers, and musicians. It’s open to everyone and there will be lots of prizes, free tshirts, food, and good times – check it out at penn-play.com! Facebook published a Valentine’s Day post about how two users interact with each other before and after they make it Facebook official. During the 100 days before the relationship starts, we observe a slow but steady increase in the number of timeline posts shared between the future couple. When the relationship starts (“day 0”), posts begin to decrease. 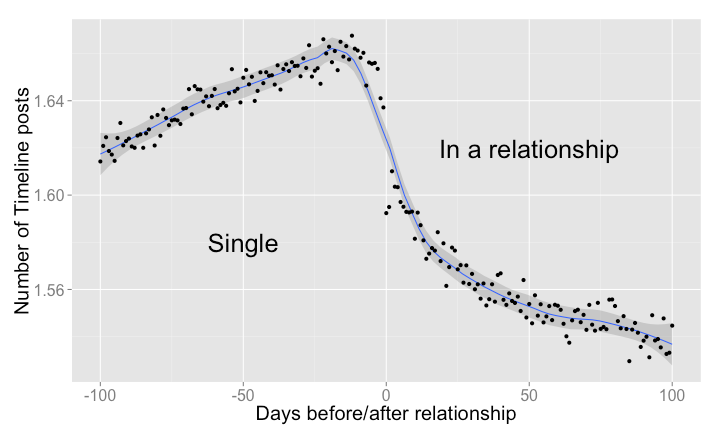 We observe a peak of 1.67 posts per day 12 days before the relationship begins, and a lowest point of 1.53 posts per day 85 days into the relationship. 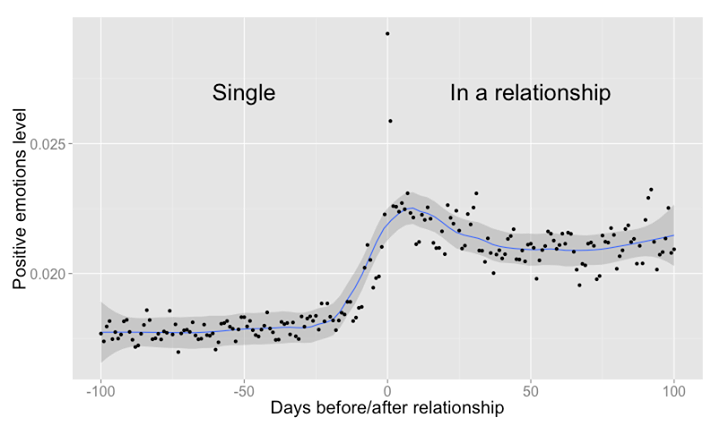 Presumably, couples decide to spend more time together, courtship is off, and online interactions give way to more interactions in the physical world. Not the most stunning of data visualizations, but a very cool way to interpret part of the huge amount of data at Facebook’s disposal. See the blog post here. Can you live on minimum wage? Putting in the cost of on campus housing on PA minimum wage leaves me with $100 left to spend per year. Hi all, remember that we are meeting at 3701 Market at 9:15 am tomorrow to meet with the research staff related to the Visualizing Happiness project. Please also upload your first project to the blog (“Project 1 (2014)”) if you haven’t already. Requires Java; view in Firefox or Safari. If you get an error that your security settings have blocked the application from running, see Windows workaround (search page for “Workaround”). For Mac users, go to System Preferences -> Java -> Security -> Medium -> OK.